Tran Thanh Tien was among 62 people in his village who were arrested and severely beaten by police in May 2010 for participating in a funeral procession and protest march to a cemetery located on disputed land in Da Nang. Police shocked him with an electric baton and beat him in his chest and arm pits from 3 pm until 10 pm. When he passed out, they threw soapy water on him. They hit him on his back with hardened plastic kitchen stools. They hung him by his handcuffed wrist from the window ledge for an entire afternoon, beating him as he hung there. After his release, when he refused to report on other villagers, police beat him again. 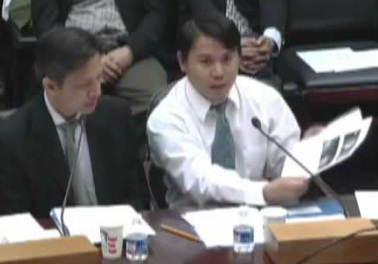 Tran Thanh Tien testifying before the U.S. Congress in April 2013 regarding human rights violations in Vietnam.